Vladimir Shabalin has won the 2018 WSOP International Circuit Main Event after almost 14 grueling hours of play. 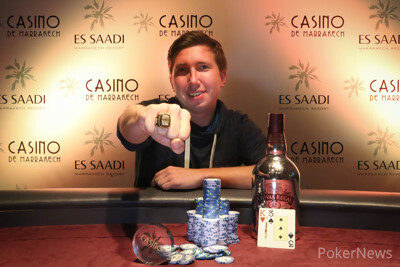 Shabalin beat 485 other players in Casino de Marrakech to bring the coveted gold WSOP Circuit Ring and a whopping 1,300,000 MAD (€114,367 / $142,033) back home with him. 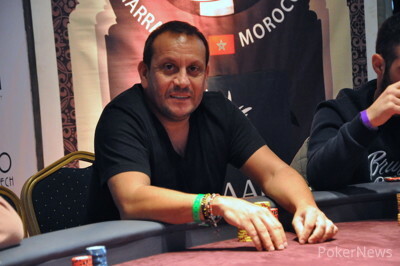 Runner-up was the last French hope, Rony Halimi, a regular on the poker circuit. Shabalin is a professional poker player who has been playing for about eight years. He started playing more live tournaments over the past years with his first live cash being recorded in January of 2016. Shabalin claimed the money didn't mean much to him, it was all about the gold WSOP Circuit Ring for him. “I was very tired after playing for more than 13 hours," Shabalin said after the tournament was over. "In that final hand, on the flop, I think I had like 3 or 4% or something? Even if I lost that hand, I would have won anyway, I played so much better. I am very happy. I play online normally but it has no soul, you don’t see emotions. In live poker, you can see when you have your opponent dominated. You can see them. I want to play more, it’s my dream. I love football, you see players like Messi and Ronaldo with big trophies, huge emotions when they win. Poker is not exactly the same but I want something like that. This ring is the most important win for now. Until the next one!” the Russian concluded. Sixteen players returned for the final day of the Main Event. They were 25 minutes to finish in the penultimate day's final level, as bust outs went faster than initially anticipated. Compared to Day 2, things started off at a slow pace on the final day. However, as soon as the second level of the day had started, the first elimination could be noted. Antoine Rahal was Shabalin’s first victim of the day when he ran his ace-queen into the ace-king of the Russian. 2017 WSOP International Circuit Paris Main Event Runner-up Pierre Merlin fell when he ran ace-king ran into the pocket queens of "NFJM". One of the more bizarre hands of the day was a three-way all-in situation between Polo Santoni, HCC and Roger Tondeur. Tondeur had pocket fives against the pocket aces of HCC and the pocket jacks of Santoni. Santoni flopped quads to eliminate Tondeur and leave "HCC" behind with about 11 big blinds. About half an hour later, Santoni dealt the final blow to "HCC" when his jack-ten won against pocket fours. When the levels increased from 60 to 75 minutes each, the next Spaniard, Nathan, was eliminated in 12th place when his ace-ten couldn’t win against the ace-jack of Mounim Kaddouri. 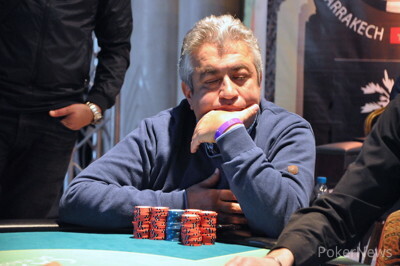 Shlomo Ohana missed his flush draw and lost to the two pair of Joseph Nassar to finish in eleventh place. The final table bubble boy ended up being Kaddouri when he shoved around twelve big blinds with ace-ten into the ace-queen of Paul. Once the final table had been set, it took around 20 minutes before 2016 WSOP International Circuit Paris Main Event winner Nicolas Noguera was eliminated when his ace-ten couldn’t win against the pocket kings of Shabalin. After almost three hours of eight-handed play, Santono was the next to leave. The Frenchman held ace-king against the pocket nines of Paul. The flop gave him a king as the window card but it also gave Paul two more nines and another flopped quads. Twenty minutes later, TMV was sent packing when another ace-king couldn’t win. Halimi held ace-queen and hit his queen on the flop and turn to eliminate TMV in 7th place. Almost three hours later (including a break), Mohamed Jhider lost with king-nine against the ace-queen of NFJM to finish 6th. "NFJM" found his Waterloo 90 minutes later when another ace-king didn’t bring a win as the king-jack of Shabalin hit another jack on the flop to give him a pair. The table didn’t even have time to recover and Paul was sent to the rail by Shabalin. Paul’s ace-eight didn’t manage to beat the ace-king of Shabalin and he was sent home in fourth place. It then took another two hours for Nassar to lose in a three-way all-in pot. Nassar held king-nine against the ace-queen of Halimi and the king-jack of Shabalin. Halimi won the hand and the leftovers went Shabalin’s way in the end. Heads-up, Shabalin had almost 4 times as much as Halimi and he wasn’t scared to use that to his advantage. Halimi didn’t get any chances to double up and the one time his all in did get called, he ran his ace-queen into the king-trey of Shabalin who hit a runner-runner straight to eliminate Halimi in second place. The PokerNews team wants to thank you for following the updates and say goodbye to you for now from the beautiful Es Saadi Resort here in Marrakech. See you soon! After having lost most of his stack due to the constant raises of Vladimir Shabalin, Rony Halimi's stack had been reduced to 1,250,000 after having paid the ante of 25,000. Halimi shoved all in from the button and Shabalin asked for a count. The dealer confirmed the amount Halimi had behind and Shabalin needed some time to consider his options. In the end, he decided to call. Everyone stormed the table again to get a closer look at what was happening. The dealer burned a card and opened the flop. Halimi had hit his two pair and turned around while a friend held him. He didn't want to see the other cards as he believed it could bring bad luck. The turn was the which gave Shabalin a straight draw. And the on the river was just what Shabalin had ordered and Halimi had hoped to avoid. Shabalin ran to Viktor Sorokin and jumped into his arms to celebrate. Shabalin was clearly overjoyed. Applause rang through the tournament room to praise Halimi's efforts for today. Shabalin walked to Halimi and they gave each other a hand and a hug. Halimi walked to the payout desk to collect his biggest live cash ever worth 890,000 MAD (€78,328). Joseph Nassar shoved all in from the button for 1,325,000 and Rony Halimi checked his own cards. He also shoved all in for 875,000. Vladimir Shabalin, in the big blind, checked his hand and called. The board ran out to give Halimi trip queens and he tripled up. Nassar has 450,000 more but those chips all went Shabalin's way as he hit his jack on the flop. Nassar has been sent home with 625,000 MAD (€55,062). Heads-up play will commence soon after the photo's have been taken. - Shabalin raised to 300,000 from the button, Joseph Nassar shoved all in from the small blind, Halimi asked for a count. The dealer confirmed it was for 1,025,000 in total. Halimi counted his own stack which was 1,200,000. He considered it for a bit and then folded. Shabalin also folded. - Shabalin raised to 300,000 from the button, Halimi shoved from the big blind. The people railing Halimi came closer towards the table (which they have been doing for each all-in, even the ones Halimi is not involved in) and Shabalin halted them. "I know you're railing him but, come on. I haven't even called yet." Shabalin looked at his cards again and then folded. - Halimi was in the small blind and counted his stack before looking at his cards. "Look at your cards first, then count." Shabalin said. "No, I need to know before." Halimi replied while continuing to count. "Ok, I will have to count my stack too then!" Shabalin replied and everyone laughed. - "Tapis!" Shabalin said from the small blind. "In Russian?" Joseph Nassar asked. "Bau Bau" Shabalin replied. "No Bau Bau" Nassar said while folding. - Nassar shoved all in from the small blind. "You have to count your chips first!" Shabalin said to Halimi and the crowd laughed. Halimi folded. We're not sure of the action during before the board was completed but it read and the pot contained 1,625,000. "Just fold, if you call, you will bust. You have to fold." Shabalin said to Halimi. "Just fold." "Maybe I call, maybe I win." Halimi replied, "You show me?" "Sure, I'll show you!" Shabalin replied. "My friend, fold and forget. 900,000 is 6 big blinds, that is a lot, it's almost one million!" Halimi folded and Shabalin showed for trip sevens. Vladimir Shabalin keeps grabbing more and more chips of Rony Halimi and Joseph Nassar. These two short stacks keep getting shorter and shorter. - Shabalin completed the small blind and Nassar checked. The flop came , Shabalin bet 300,000, Nassar raised to 700,000 and Shabalin called. The turn brought them the , now Shabalin check-folded to the 700,000 bet of Nassar. - Shabalin completed the small blind and Nassar checked. The flop came , Shabalin bet 200, Nassar called. They both checked through the on the turn to the on the river. Shabalin bet 350,000 and Nassar called. Shabalin tabled for a turned straight and Nassar showed the for a pair of fours. Who Will Be Crowned As 2018 WSOP International Circuit Marrakech Main Event Champion?